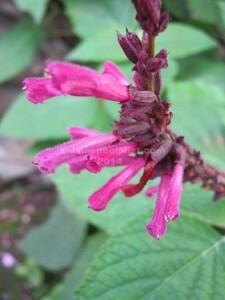 This Guatemalan salvia flowers in winter. It has a multitude of canes with rosy pink tubular flowers. There are quite a few pink winter flowering salvias, some of which are larger than curtiflora. It is frost tender under -2 and not real happy in drought. It will grow in part shade. It is easy to grow from cuttings. There is only a letter different to curviflora which is an exceptional also pink flowering plant. sorry out of stock Sprucei is fairly similar.